2017 was the year when bezels were out and big screens were in - could 2018 be the year when everyone brings out a foldable phone? We've already seen the ZTE Axon M, featuring a dual display with a hinge, and it sounds like Huawei has something similar in the works for a potential 2018 launch. The company's CEO Richard Yu told CNET that Huawei already has a "working sample" that it's working on refining. Apparently it follows the blueprint set down by the Axon M, but the manufacturer's engineers are working on reducing the gap between the phone's two displays. For the time being at least, it seems as though foldable phones will be two displays stitched together, but in the longer term we could see one seamless display that can bend in the middle. Yu says Huawei could launch its first foldable phone next year, but the timeline isn't set yet. In terms of looks and form factor, smartphones haven't changed all that much over the past decade, although the phones of 2017 certainly look better than their predecessors. Foldable technology could be just the hardware innovation that handset makers have been looking for. Rumors of a foldable Samsung phone called the Galaxy X have been swirling for years, and it sounds like 2018 might finally be the year when it sees the light of day. Meanwhile, LG and Apple have also been tipped to launch something similar in the not too distant future. It's certainly a massive engineering challenge to get this kind of technology working, and working well, but if the big companies can crack it then it's likely to lead to a boost in sales. 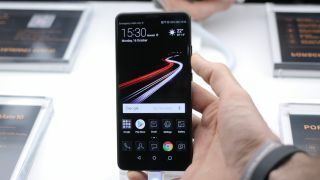 As soon as Huawei makes anything official we will of course let you know, but in the meantime there's the Huawei Mate 10 to consider.